During November–December 2011, an excavation was conducted at the Horbat Kelah antiquities site in Modi‘in (Permit No. A-6349; map ref. 19780–800/64850–60), prior to enlarging the cemetery (Fig. 1). 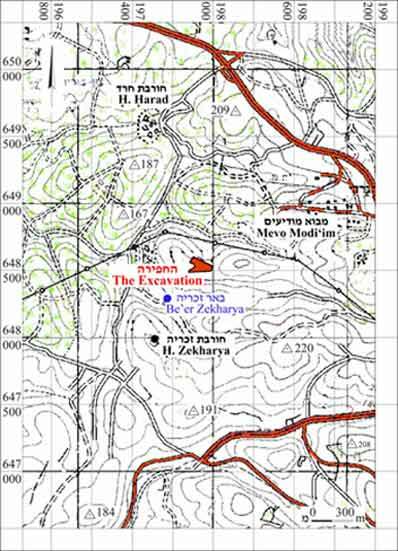 The excavation, on behalf of the Israel Antiquities Authority, was directed by P. Spivak, with the assistance of E. Bachar (administration), A. Peretz (field photography), H. Ben-Ari (GPS) and M. Kunin (drafting). Installations for the processing of agricultural produce (oil and wine) and field walls (Fig. 2) were documented; no small finds that could aid in dating the remains were discovered. Similar finds are known from other excavations in the region (HA-ESI 122; HA-ESI 122). An assemblage of flint artifacts was collected from the surface of the hill. Winepress F1. The simple winepress was hewn in limestone bedrock (Fig. 3); it consisted of a rectangular treading surface (2.0×2.5 m) that drained into a square collecting vat located to the east (Fig. 4). The floor of the collecting vat was breached and the winepress ceased to be used. Near the damaged collecting vat were several rock-hewn grooves that probably marked the outline of a new collecting vat. Square winepresses are a fairly common phenomenon in the Modi‘in region and they mostly date to the Second Temple period (‘Atiqot 34:121–172). Work Surface F6. 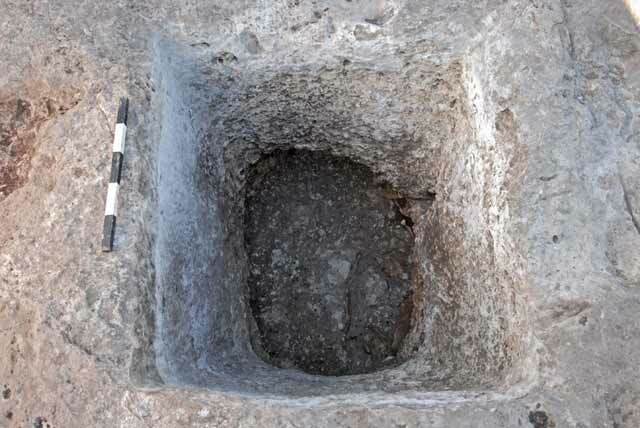 A natural bedrock surface in which a small winepress, a bodeda and many circular depressions are hewn (Fig. 3). The winepress has an elliptical treading floor that drained north to a shallow round collecting vat (depth c. 0.2 m). The bodeda had a shallow round work surface that was flat, surrounded by a hewn groove that drained into a round cupmark. Circular Depressions. Around the two installations in Work Surface F6 were sixteen small circular depressions, probably used in conjunction with the work surface. Single depressions were also found near Winepress F1. Dozens of other depressions were identified in the excavation area. Fifteen such depressions, occurring in pairs, triplets and larger clusters that are not connected to any work surface, were documented in the small area F5 (5×5 m; Fig. 3). All the depressions had a uniform size (width 5–7 cm, depth 7–10 cm) and it seems that they were carved in the same manner using the same tools. 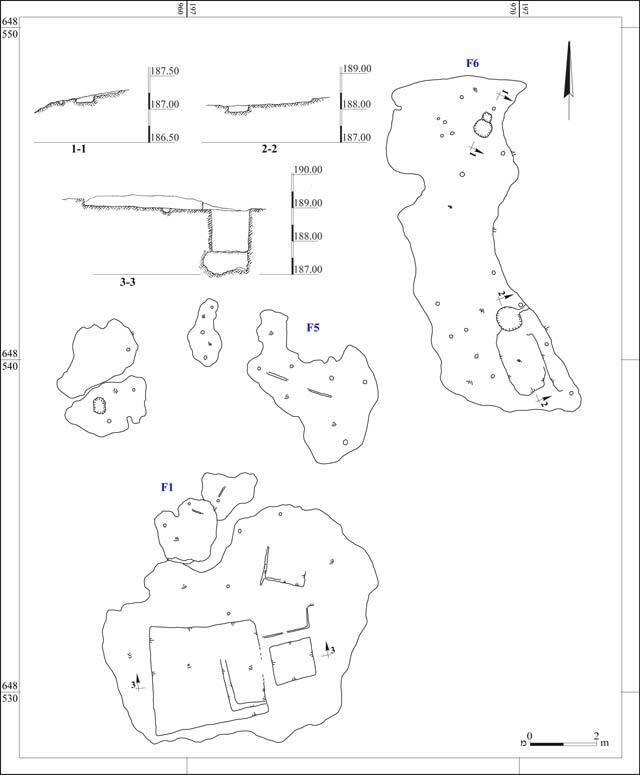 Similar concentrations of circular depressions in bedrock surfaces, not connected to agricultural installations, are known from other excavations in the Modi‘in region (ESI 20:89*). Complex F2. Three walls (W7, W8, W9; Fig. 2) built of large fieldstones (boulders), which formed a triangular compound with a narrow opening and may have been used as an animal pen. Complex F3. Two parallel walls (W12, W13; Fig. 2) built of fieldstones and generally aligned northwest-southeast. Wall 13 was longer than W12 and they were situated c. 2 m apart. The walls were not associated with any other finds and their function is unclear; their southern part was severed by a modern rock-cutting. Other meager remains of field walls (W15, W16; Fig. 2) were noted along the northern side of the hilltop. Flint Artifacts. An assemblage of flint artifacts was gathered from the surface in four squares (B2, C3, D2, D3; each square 50×50 m; Table 1). The assemblage includes a few flaked artifacts (Table 2) and numerous natural fragments that originated from larger natural chunks of flint in the western part of the excavation region. The flint chunks are more common toward the top of the hill, west of the excavation area. Apart from three bifacial debitage, the flint assemblage lacks unique artifacts that make it possible to determine the period and nature of the prehistoric activity at the site. Based on the pieces of debitage it is not possible to reconstruct the shape of the bifacial tools, but these were probably axes which were common to the Neolithic period. Axes and other bifacial implements from the Pre-Pottery Neolithic A are well known in Modi‘in (Grossman L. and Goren-Inbar N. 2010, Evidence in the Rock – A Neolithic Quarry on Giv‘at Kaizer, Modi‘in. In Innovations in the Archaeology of Jerusalem and the Surrounding Area. Volume 4, pp. 40–49; HA-ESI 122; ‘Atiqot 51:1–14). No diagnostic potsherds were found in the excavation and it was not possible to date the installations or the walls. The excavation finds indicate that agricultural produce that was apparently grown in the area was processed at the site. 3. Winepress F1, Work Surface F6 and the cluster of depressions F5, plans and sections. 4. Winepress F1, the collecting vat.